Caption: What’s wrong with this picture? Read on! The graphic focuses primarily on the solar wind, or the continuous flow of plasma — a high-temperature mix of charged particles — from the sun. But while the solar wind is essential to understanding auroras, there are other factors involved in creating these celestial light displays. By only considering the solar wind, we leave some key questions unanswered. For example, why do we see the aurora at night (when we’re facing away from the sun)? You can think of the particles as being “trapped” by the field lines. And that’s precisely what’s happening in the solar wind! Bound up in the plasma are bits of the sun’s magnetic field. Earth is a giant magnet, too, and ultimately it’s the interaction between the sun’s magnetic field and Earth’s that leads to the aurora. The underlying mechanism of that interaction, which transfers energy between the two fields, is known as magnetic reconnection. Each magnetic field line has a direction (as indicated by the arrows). 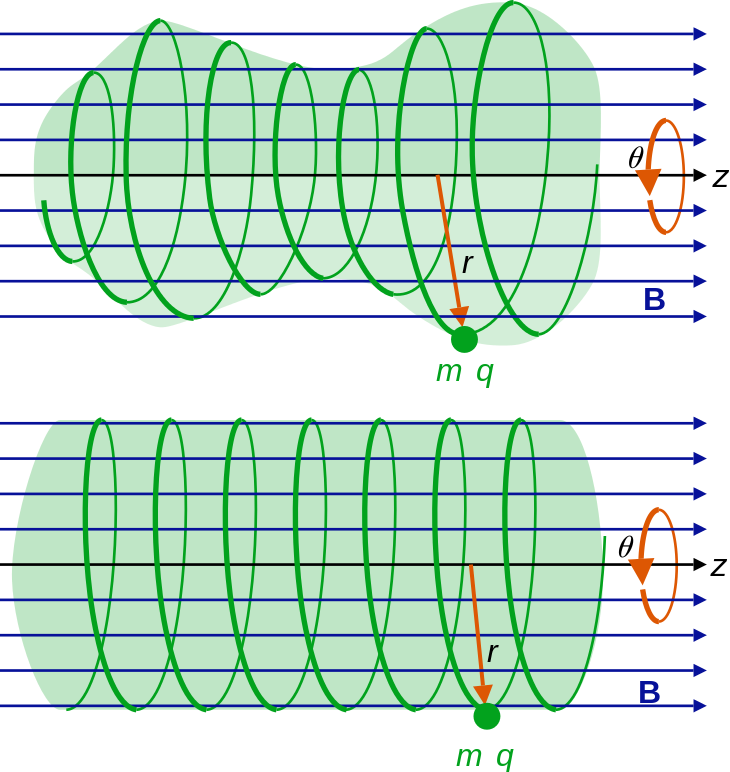 By convention, we say that a magnet’s field lines extend from the north pole to the south pole. (Fun fact: the Earth’s geographic north pole is actually its magnetic south pole.) Reconnection occurs when opposing field lines come into contact. You’ll note that the Earth’s magnetic field is lopsided. 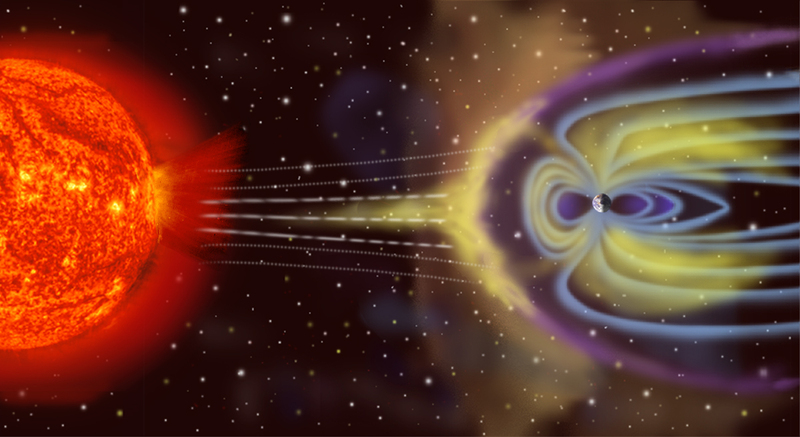 Earth’s magnetosphere — or the portion of space dominated by Earth’s magnetic field — acts as an obstacle to the solar wind, shielding the planet (and its inhabitants) from harmful solar radiation. 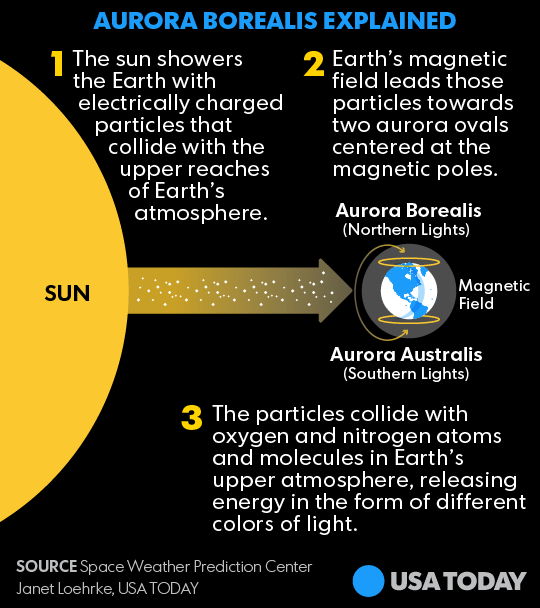 The incoming solar wind, with its embedded magnetic field, exerts pressure on Earth’s magnetic field, sending it to the far side — that is, the side of Earth experiencing night — and forming a distinctive “tail” that points in the direction opposite the sun. This feature, aptly named the magnetotail, extends over 500,000 km into interplanetary space – that’s about 38 times the diameter of Earth!When the solar wind hits Earth’s magnetic field, the wind slows down dramatically, creating a shock wave called the bow shock. The bow shock diverts the stream of charged particles (and the magnetic field it carries) into paths that run alongside Earth’s magnetic field. In certain spots, the solar and planetary magnetic fields point in opposite directions, and reconnection takes place. The resulting new field lines — a combination of the sun’s and Earth’s — are swept back toward the magnetotail. The process is a bit like swimming breaststroke in an endless pool within the ecliptic plane. We’ll explore that analogy further in an upcoming post. Stay tuned! So why does aurora happen when we’re facing away from the sun? Reconnection also happens on Earth’s night side. As the energy from the solar wind is transferred into the magnetotail, it interacts with the charged particles already trapped there. When opposing field lines approach one another in the magnetotail, a portion of the magnetic field pinches off into space. The rest, meanwhile, snaps back toward us. As the charged particles accelerate toward Earth’s poles, they pick up even more energy. Once they slam into the atmosphere, that energy is transferred to the atoms they encounter. But the atoms can’t hold on to that extra energy for long — so they re-emit it as light. The color of the light corresponds to the amount of energy absorbed by a given atom, as well as the type of atom it is. Oxygen, for example, can produce either green or red emissions, whereas nitrogen’s are generally violet or blue. These emissions are what we perceive as the aurora. Now you know the real story: magnetic reconnection in the magnetotail is why you can see the aurora even when you’re facing away from the sun. Nighttime auroras cannot be explained by the solar wind alone! The magnetosphere is a complex jungle of plasma, and it’s the greatest physics lab we can actually sample so let’s make sure we give credit where credit is due!